Are you a golf enthusiast? Do you have a bucket list of golf courses to play before you leave this beautiful rock? GOLF just released its 2017-2018 100 Top Golf Courses from around the world, and I want to go through my top “Bucket List” courses. How does a course from the 100 Top Golf Courses make the cut on my Bucket List? Well, first they need to be next to a large body of water. There is nothing like walking down Hole 10 on the famous Pebble Beach Golf Links basking in the ocean waves and cool breeze. Another requirement is that it has to have a signature hole or course designed by one of the greats like Seve Ballesteros’s famously designed Los Arqueros Golf Club in Spain, Pete Dye’s Crooked Stick Golf Club in Carmel, Indiana or one of the many great Arnold Palmer designed golf courses around the world. And my final requirement to add a great course on to my list is that it cannot be in a climate of 90 degrees Fahrenheit or higher… Just not my style to catch fire when playing a peaceful round of golf. Let’s get right down to my list and to keep this blog short; I will only go over my TOP 3 Bucket List MUST PLAY Golf Courses. The Old Course at St. Andrews is one of a kind and takes you back to how golf was originally played. Since this course was not designed like newly modern courses, it is over six centuries old and has hosted 29 Open Championships. The Old Course is also the home of The Road Hole, the par-4 17th, one of the world’s most famous golf holes and did I mention that it was built right next to the River Eden and the North Sea. This is where it all began and to be able to step foot onto this course and feel the history behind it is one of the main reasons this course makes my list. Famous hole, CHECK. Built next to a body of water, CHECK. Climate no hotter than 90 degrees Fahrenheit, CHECK. 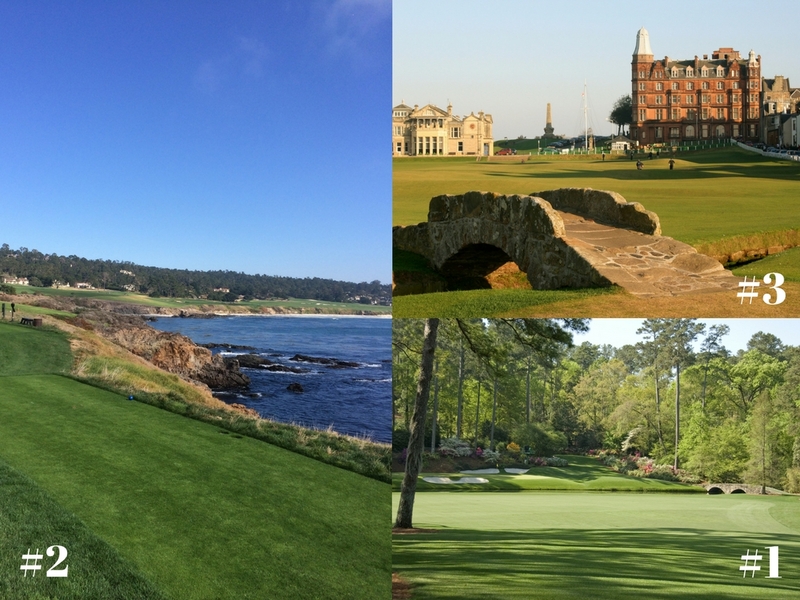 Pebble Beach Golf Links makes the cut, and we all know why this course made my top 3 list. There are two iconic holes on this course, hole #7 and hole #18. Everyone wants to take a shot at the 106 yard, par 3 Hole #7 when the winds are 20+ mph in your face, and you have to hit 6 iron 150+ yards to land on a small leaf pad of a green. Miss it long and say “Hello to the fishes,” miss it short, well, we all know it’s best not to miss it short, or you won’t hear the end of it. This course has fantastic views along the Pacific coastline with one last gaze finishing your round on the 18th hole. Pebble Beach has also hosted the US Open 5 times with an exceptionally distinguished set of champions including Jack Nicklaus, Tom Watson, Tom Kite, Tiger Woods, and Graeme McDowell. Now to the course that every golfer on this planet dreams of playing, Augusta National Golf Club. This course is the unicorn of the golfing world and is almost impossible to play without knowing someone. And even then you still won’t get a chance to play the famous course because rumor has it that members only get to play 4 times a year. Now you might be asking yourself, “But this course does not meet……” IT DOES NOT MATTER that this course does not meet my requirements to make my Top 3 Bucket List. This is the one, and only Augusta National where legends are made, and men are turned into little boys. Who does not want to play the course where it ate up Jordan Spieth’s dreams on the second go around? Who does not want to walk in the same footsteps as Tiger Woods, Sergio Garcia, Bubba Watson, Phil Mickelson, Nick Faldo, Jack Nicklaus, Arnold Palmer, etc. THE LIST GOES ON! These are legends of the old and modern era of golf, and that is what makes this course so unique. I will do my best to tame this beast if ever given the opportunity. Famous hole, CHECK. Built next to a body of water, DON’T CARE. Climate, no hotter than 90 degrees Fahrenheit, DON’T CARE. There are my Top 3 Bucket List Golf Courses I have to play before I leave this planet. 2 out of the 3 courses are very attainable with a few golf buddies who want to drop a good $2k-$5k on a golf trip. That final course may be a tough one, but I’ll get my chance to play it someday. What are your top 3 bucket list courses? Send us your top 3 courses for a chance to win some FREE SWAG! Thank you for reading this post and taking the time out of your day to hit that LIKE button to show your support.